The DJIA is an economic benchmark for the US economy. The Dow Jones industrial average is a price-weighted index that tracks 30 of the largest American corporations. 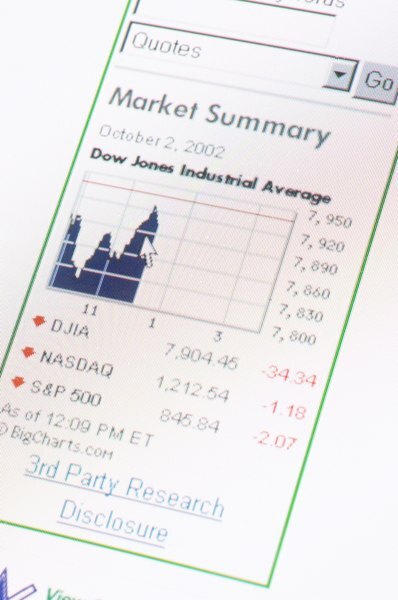 General Electric, IBM, General Motors and AT&T are some of the companies included in the Dow. While you cannot directly trade the Dow, you can invest in securities and derivatives that are designed to mirror the Dow’s movements. If you think that the economy is slowing down or in a recession, you can short the Dow to profit from any downward moves. An exchange traded fund, or ETF, holds a portfolio of stocks that seeks to duplicate the indices’ performance and yield. An inverse leveraged ETF is designed to return 1x, 2x or 3x the movement of the Dow as it falls. For example, you purchase an inverse ETF for $50 a share when the Dow is at 10,000. If the Dow falls 10 percent, the 1x inverse ETF share price increases 10 percent to $55 a share, which is $50 multiplied by 10 percent added to the original $50 a share. The 2x inverse ETF share price increases 20 percent to $60 a share, and the 3x inverse ETF share price increases 30 percent to $65 a share. You can short the Dow and get increased leverage by purchasing a call option on an inverse ETF. The share price of inverse ETFs and their call options increase in price as the Dow falls. If the Dow drops four percent, an inverse 2x ETF’s share price increases 8 percent. Since options are leveraged instruments, the price of an inverse 2x ETF call option could increase 20 percent or more. Should the Dow go up instead of down, the call option will lose value almost as fast. Buying a put option gives you the right, but not the obligation, to sell shares of the underlying security that mirrors the Dow. The option price increases in value as the Dow falls. You must select an underlying security that offers option trading. You must also decide how much time you want the option to have until it expires, and how much you want to invest. Buying a put option as opposed to selling a put option limits your risk to what you paid for the option. You can sell a Dow commodity futures contract to short the Dow. You must open an account with a commodity futures brokerage firm and establish a margin account. You must deposit an initial margin of $5,500 and keep $5,000 as maintenance margin to trade one standard contract. As the Dow falls, you make money as the price of the futures contract falls. When you buy back the contract, your profit is the difference between the higher price you sold it at and the lower price at which you bought the contract back. Should the Dow rise, the commodity futures contract price increases and you lose money.